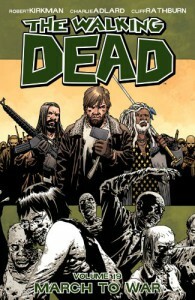 I'm not a regular comic book reader, but I was drawn to The Walking Dead because I'm a huge fan of the show. And once I started reading I finished all the volumes in a couple of days without putting them down. I can see why this series has such success and has gotten so much acclaim. I like the comics much better then the show, but I think the series has reached a level of mediocrity ever since issue #100. Boring plots, repetitive scenarios and characters. I don't doubt that humanity could sink to some frightening depths in a disaster such as this, but some of the later chapters were so over-the-top it seemed they where put there just for simple shock value. I didn't enjoy this volume as much as others. It's the equivalent of the second season of the show where nothing really happens. It feels like Kirkman is just running on repeat right now. The story drags on with a build-up to "the war" and the main battle is still to come. This means that people will get to follow the tragically boring exploits of Rick and his crew as they do battle with Negan AKA The Governor Part II. Kill Negan already! There are some interesting parts that I honestly enjoyed, but the overall story is so over-the-top silly. I really hope Volume 20 will get things back on track with a quality blend of genuine character development, heart-in-your-throat action, and satisfying plot twists. If you're reading this because you're a fan of the show and are looking to start reading the comics, there is no better place to start. So anyone in need of a very well done zombie fix should absolutely get down with The Walking Dead sickness. Come witness the end of the world. . . and the beginning of a new one.